So as mentioned in this post, I’m the proud owner of a pair of Boston Celtic half-season tickets. About a week or two ago an invoice arrived in the mail for playoff tickets and today I finally secured my seats for rounds 1 & 2 of the NBA playoffs (and just a few days before the March 14th deadline). Playoff basketball is back in Boston baby! When this invoice arrived a couple weeks ago (in February) I thought it was just a tad early but knew we’d clinch a spot in the playoffs soon enough. Well, the Celtics have indeed clinched that playoff spot and right now sit at the top of the NBA with a 49-12 record. That’s a a winning percentage of .803! After realizing how ridiculous of a record that is, I started wondering what the precedent is for NBA teams with a regular season record over .800. I found a wikipedia entry detailing NBA teams by single season win percentage. Of the eleven teams to finish over .800, a whopping eight have gone on to win the NBA championship. 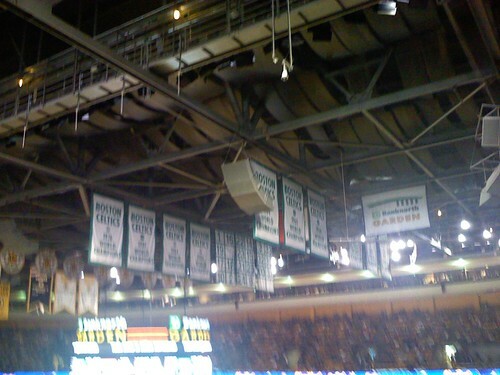 I know there’s still a lot of games left in this season, but if the regular season were to end today history would certainly be on the Celtics side to claim another championship banner. I’d like to see a finals game should you want to sell any such tickets. I’ll keep my fingers crossed. Lucky you! Enjoy the energy at rounds 1 and 2. Thanks ……. Davey, considering I am currently unemployed I’d love to sell you some of my Celtics playoff tickets at a fair markup to bring in some cash for myself, BUT, as such actions are illegal in our fine state I’ll be holding onto the tickets.